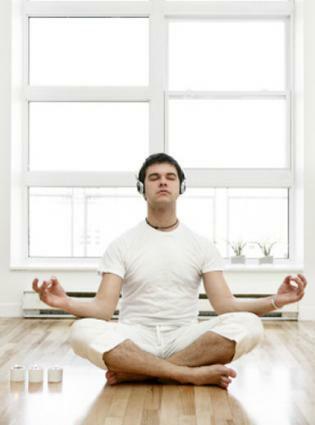 The benefits of yoga music vary, depending on the individual. Traditionalists don't listen to music with their yoga practice. However, many other people are open to enhancing the connection between sound and movement. They want to explore how the combination affects the body, mind, and spirit. For anyone who has eased into an asana to the strains of an Indian flute, it might be surprising to learn that classical yoga is not performed to a soundtrack. Traditional yogis still feel this way: yoga is a pathway to greater enlightment. Consequently, one needs to listen to one's inner voice, not to external influences. As the practice evolved, many people were unaccustomed to complete silence. They had difficulty letting go and embracing such an intimate focus. Soft, instrumental music provided a bridge by which to introduce yoga to the Western world. But, other ancient practices involving sound exist. For example, Shakti Yoga, a practice believed to be centuries old, uses chants and incorporates elements of Tantra Yoga to stimulate the chakras and prepare the senses for higher consciousness. Keep in mind that what may sound pleasant or relaxing to some might be grating noise to others. This is why the research of sound and its effects continues. Dr. Gunther Hildebrandt studied biological rhythms in relation to music and how it affects our healing process. Dr. Mia Olson integrated the principles of yoga with music practice to help her students perform better. Dr. Alfred Tomatis developed the The Listening Program, a method that uses auditory stimulation to curb undesirable impulses, reduce the symptoms of disease, and promote relaxation. For a yoga instructor, the music that accompanies a routine is a personal extension of his or her yoga philosophy. Shiva Rea is deeply involved in the selection of yoga music in her routines and on her site. On her website, Rea shares that "the CDs are offerings from our heart". One of her yoga specialties is yoga trance dance, and music plays an integral part of the routine. On the disc Yoga Trance Dance, Rea choose dynamic music by artists Ben Leinbach, Geoffrey Gordon, and Jai Uttal, among others. Sample a clip of Yoga Trance Dance here. Listen to some of Rea's other compilations, including Yoga Rhythms and Yoga Sol. Yoga instructor, musician, and former monk Steve Ross defies yoga music stereotypes. If you take a class at his Los Angeles studio, Maha Yoga, or follow along with the program "Breathe" on the Oxygen network, you won't often hear a sitar or windchimes. More than likely, you'll be doing Sun Salutations to Tupac Shakur or The Beatles. His desire is to present yoga in a fun, celebratory way. The music he selects imprints this approach. He has many devotees. Ross released a non-traditional chant CD called Grace is the Name of the Game: Chants for Modern Yogis, which you can listen to at iTunes. Musician and instructor Russill Paul is an expert in sonic mysticism. His most famous work is The Yoga of Sound: Tapping Into the Hidden Power of Chant. It's a lesson on the effects of music and other sounds on our consciousness. Review Paul's book and he's released a number of other CDs, including Shabda Yoga, a combination of Vedic chants and music designed to promote healing and works well for meditation. The topic of the benefits of yoga music and the impression of sound on the mind, body, and spirit is quite popular. You might be interested in what others have to say on the subject. Ted Andrews shares his philosophy regarding the power of music in Sacred Sounds: Magic and Healing through Words and Music. This book focuses on various forms of vocalization, including chanting and song, and the direct effects to the body. Dr. June Wieder examines the relationship between tonal vibrations and the spine in her work, Song of the Spine. She introduces a form of therapy called bone toning. If you'd like to explore a deeper relationship with your yoga music, try creating a soundtrack. Last.fm features thousands of titles identified by mood or purpose. Read how founder Michael Perricone put the site together in this LoveToKnow Yoga interview.